The acoustical tile company sounds off on why 50 years is just the start of their journey. 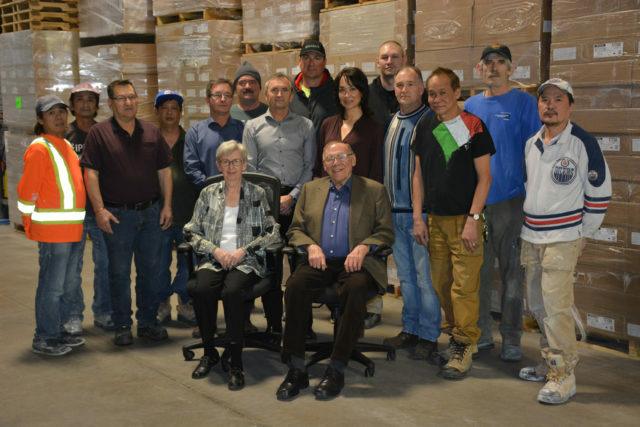 Founders George & Doreen Burke (seated) and the staff at Burke Interior Systems. George Burke, the founder of Burke Interior Systems, had the unique ability to see past the current trends and anticipate what was going to work for his company in the future. He never once subscribed to the “tried and true so let’s never change it” formula. He loved to push the envelope, trying new things, taking chances and expanding into different markets. It’s a strategy that served him well. Burke Interior Systems turns 50 this year, and while George has since retired, he continues to witness the company thrive in the hands of his son-in-law and current company owner, Kevin Cassidy, who joined the company in 1977. 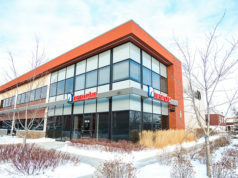 In addition to acoustic ceilings, which is still the company’s main focus half a century later, Burke Interior Systems also, in the past, sold office furniture, demountable partitions and access flooring for mainframe computers. This is a company that was never afraid to flex with the times, see what was needed, and provide it. “That was just George’s nature,” says Kevin. “He couldn’t be happy doing just one thing. When I joined in 1977, we were actually doing more partitions than ceilings because the industry was ripe for that kind of thing at the time. Now it’s all about the drywall, but in the 70s and early 80s, we did miles and miles of partitions. We even stocked five or six different colours of vinyl board. We got into computer and access flooring when large mainframes were emerging in offices. There are still new things coming up that I know are going to be big in the future, and I want to be a part of that. One of the products that is quickly sweeping new commercial construction is beautifully designed wood acoustic panelling, a trend in which Armstrong® Ceilings, one of the companies that Burke Interior Systems buys directly from, is leading the way. “We work with innovative products and have been pleased to deal with Armstrong for 38 years. Years ago, only T bar and acoustic ceiling tile were being offered. Not only do we now offer a wide range of architectural specialities, such as wood panels, curved infusions panels, metal linear and fabric panels and all sorts of other great new products, but we also have experienced tradespeople who have the expertise to install these exciting new products!” says Kevin with enthusiasm. Armstrong is just one of the manufacturers that Burke purchases directly from. Kevin points out that the company’s longevity, reputation and diverse business interests puts them in the enviable position to purchase directly from a number of large manufacturers, and being able to skip the distributor channels benefits both the company and its clients. This also allows Burke to sell its products for distribution to various building supply stores, as well as directly to other contractors. 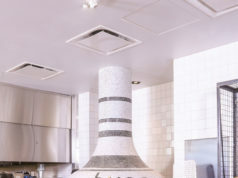 While the company is well known for its beautiful work in impressive buildings like Manulife Place, Scotia Place and 50th Street Twin Atria, as well as newer projects such as Edmonton Tower, Burke Interior System’s agility was what helped the company earn an important role in supplying and being trusted with the daunting task of rushing 5.5 tractor trailers full of ceiling tiles to Fort McMurray after the “Beast” fire to help with the hospital restoration. “That should have been an impossible task with the time limit that we were given. Not only did we special order the tile, we managed to have it out there within three weeks from submitting the order,” remembers Kevin. One of the things Kevin is very passionate about is creating better office, commercial and institutional environments through proper acoustical design. “Acoustics – one of the least understood things on the planet!” Kevin exclaims. “It’s so important! When I think of providing people with a comfortable environment, I think of acoustics.” He lists, as an example, a bad acoustical design is having to shout in a restaurant to be heard over the other diners and the music. “Acoustics are hard to fix after the fact, so do it at the forefront when designing the space. Noise needs to be absorbed, whether it is by the flooring, walls, or most importantly, by the ceilings. With the great new products and designs being offered now, not only can your space be acoustically sound, but also a beautiful space to spend time in. Come to me with any acoustical problem and, thanks to 40 years in the industry, I will solve it! When we do a particular job where I’ve had a hand in the design and helped to make a difference to a problem, the satisfaction we get from that is a great feeling,” smiles Kevin, but he’s the first to admit that everything is a team effort. In addition to leading the company in providing outstanding products and services, it’s his mission to help builders understand the importance of acoustical design. For Kevin, Burke is more than a job. It’s his life. Innovation, foresight and hard work have given Burke Interior Systems a place in Alberta’s marketplace for 50 years, and the same ethical values, outstanding products and constant willingness to flow with the times will keep the company relevant for years to come. 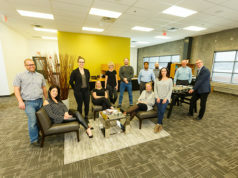 On behalf of the team, Kevin says a very heartfelt thank you to their clients, vendors, supporters and suppliers, as well as to Armstrong Ceilings for their innovative products and for standing behind Burke for so many years. “What’s next for us?” Kevin grins with excitement. “We will keep doing what we do best, and we’ll see you on our 75 anniversary!